ESP-WROOM-32 is one of the most commonly ESP32 WiFi + Bluetooth module, and does the job for many applications. However, it only includes 4MB (32Mbit) flash, and no external PSRAM, while Espressif ESP32 chip itself supports up to 128 Mbit (16MB) NOR flash and up to 32Mbit (4MB) PSRAM, so for applications demanding more resources (e.g. MicroPython), or for initial development it would good to have a module maxing out memory and storage capabilities of the chip. 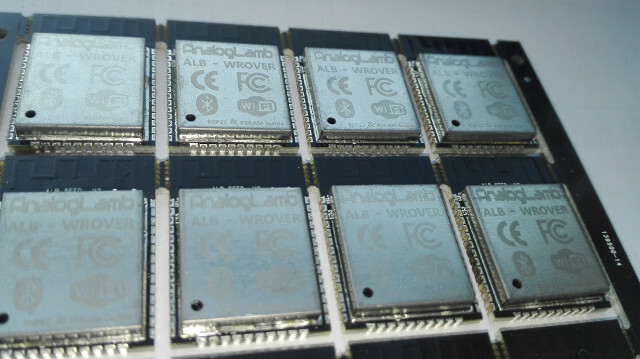 Analog Lamb ALB32-WROVER does exactly that with 32 Mbit PSRAM, and 32 to 128 Mbit flash, in a form factor compatible with ESP-WROOM-32 module. As you may know, the V0 ESP32 had a bug in it that stopped psram from working at all. V1 mostly solved this bug, but not entirely: some instruction sequences, sometimes only in combination with an interrupt at a very specific time, could cause data corruption. We spent a fair amount of time characterizing and tracing back the origin of this bug before formulating a feasible workaround. This is also why you need to grab a new toolchain: it doesn’t emit the instruction sequences that have a potential for errors. So it has to be a mistake, or the extra RAM should not be available at all… [Update: AnalogLamb said Rev1 will be used] It should also be noted that accessing the external SRAM is estimated to lead to a 10 to 20% performance hit. AL32-WROOM module can be purchased for $6.69 to $9.99 on AnalogLamb store. The company does not seem to offer a development kit with the module soldered to the board, so you may have to get one of the many ESP-WROOM-32 breakout boards and solder it yourself. Alternatively, if you are happy with 4MB PSRAM and 4MB flash, there’s always ESP32-WROVER-KIT, “tiny ESP32 WROVER pSRAM board“, or Wemos LOLIN32 Pro (currently unavailable).